LONDON, UK, 2018-Nov-09 — /Travel PR News/ — British Airways has revealed it’s offering a new style of work experience – this time for teachers, not pupils. The airline has already received huge demand for the one-day work experience sessions and is urging teachers to apply now for one of the limited number of spaces still available. The new programme, called ‘Teacher Take-Off’, sees teachers being invited into a number of departments across the airline, including British Airways’ operations centre, its engineering bays and airport terminals. Teachers from London, Glasgow and Cardiff will bring this first-hand experience of the aviation industry back to their classrooms and incorporate it into lessons, providing their pupils with real-life working examples of topics they are learning in the classroom. Teachers play a huge role in shaping children’s career aspirations. Through this innovative programme, British Airways continues its mission to highlight to young people, both male and female, the broad range of Science, Technology, Engineering and Mathematics (STEM) careers available at the airline. The initiative is on top of the airline’s traditional work experience programme. 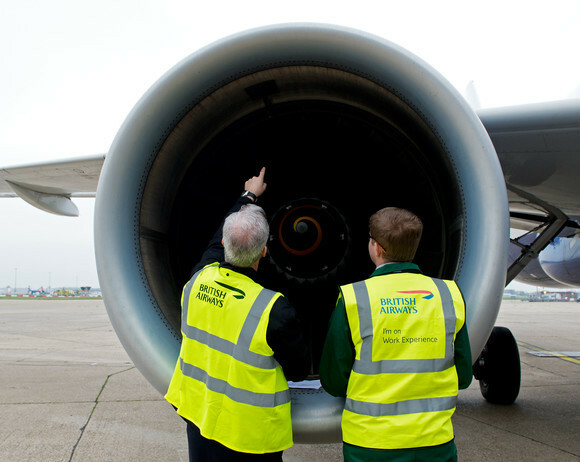 This year more than 600 children have taken part in week-long placements including 10,000 hours of mentoring in areas around the business from Engineering, Flight Operations and Customer Service at Heathrow, Gatwick, Cardiff and Glasgow. The airline’s work experience programme has been awarded Gold status by Fair Train, the leading work experience accreditation body, backed by Ofsted and the Department for Education, recognising that students are getting the very best experience when they spend time at British Airways. Fair Train is a national charity, and Group Training Association for the Voluntary and Community Sector. The Work Experience Quality Standard accreditation was developed by Fair Train in partnership with a wide range of employers and learning providers, as well as the Department for Education, Ofsted and the TUC. This entry was posted in Airlines, Travel, Travel Education & Courses, Travelers and tagged Aviation, British Airways, Cardiff, career, Glasgow, London, Mel Kose, Shivani Godhania, STEM, students, teachers. Bookmark the permalink.